"I spent 30 minutes organizing my database and about 15 minutes building the actual application." The MyExpense Tracker application was designed to help me track and segregate my business expenses and, secondly, to help me learn how to develop an application in Iron Speed Designer, giving me an opportunity to learn how to integrate code customization into the application. The application creates a tracking ID which tells me which client the expense was incurred against and the contract. The user enters a new client into the My File Tracker application and the system creates a unique serial number and assigns it to that client. Once this process is complete and the client is active in the system, the user creates a contract for this account. It is possible for one company to have multiple contracts (e.g. projects) with the company at any given time, so each contract is numbered for added convenience. The application uses a similar protocol to track internal business expenses for employees. An employee registers and is assigned a serial number. From here, they create an expense group for each business event, such as business trips, for example. I created an Expense Group which is used to bundle the expenses into a common category such as when taking a business trip. This can be taken one step further as the employee can then login to each individual expense in a particular group to update transaction information. This makes it very easy to keep track of business spending over the course of the year. The following diagram highlights the hierarchy ID structure. The application uses a single Microsoft SQL Server database and has 11 tables. The largest table contains approximately 400 records which have accumulated in the first three months since inception. This table will continue to grow as time goes on and additional clients and expenses are added. The application contains 20 functional web pages. I use the application to process between 15 and 20 transactions per month. I built the application by myself in three days. The Iron Speed Designer portion of the product took considerably less time. I spent about 30 minutes organizing my database and about 15 minutes creating the actual application. I spent the next two days researching Iron Speed Designer and customizing the code. Code customizations have been incorporated to handle the assignment of tracking numbers. 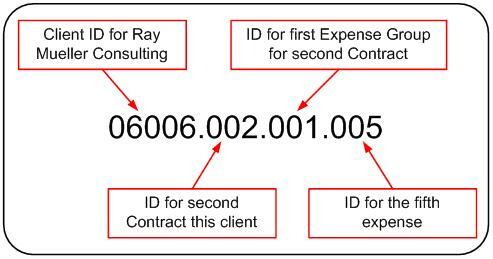 Each client entry required the creation of its own dedicated identification numbers for tracking individual contracts, expense groups and individual expenses. 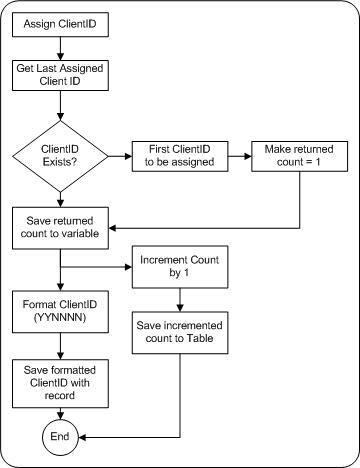 Nearly all of the code customization takes place on the GETUIData() routines in the RecordControl classes where the application retrieves a counter from a table, increments the counter, formats the data, saves the incremented count back to the table and saves the formatted client ID with the client record. The following flowchart typifies the process. The process for creating the unique identification numbers follow the similar process. There are approximately 60 lines of custom code in this application which I implemented in two days! I used the standard McKinley design theme in Iron Speed Designer. Iron Speed Designer's ability to build application web pages saved me a week of development time alone! Normally, by hand, it would take me at least two or three weeks to get this far. I estimate that it saved me no less than 16 person-hours of hand-coding. Iron Speed Designer would have saved me thousands of dollars if I had been building this application for a client. This being said, in-house, it saved me the cost of purchasing QuickBooks software, as this was my alternative. There is no way I would have attempted this project on my own. I just don't have enough time to build an application like for myself by hand. The application as it is built today is functional and works extremely well as far as input of information. Over the coming months, the application will go through a number of enhancements to include client payments, documenting billable hours and making the entry process easier. I may also deploy the application to several client sites in the future. Ray has been involved in technology for thirty years and has recently taken up application development as the means to bring conceptual ideas to businesses. His experience spans a number of industry verticals specializing in BPO, call center technology, new start-up companies, eCommerce, IVR, VoIP, customer care and retention applications and general Internet applications.